Collection. This lovely exhibit is FREE and about 2 seconds away from my school. I'm definitely going to pop in again sometime soon. PS- Thank you all SO much for Paris advice! It was all so helpful, really. you look stunning! have fun in Paris! Lovely outfit, warm and cosy! I will be visiting london next weekend, any tips on where I should definitaly spend my money? I love your outfit (much better to what you've been wearing recently) and you look amazing with your hair like that! i love "the swing" picture...i wrote a paper about it in one of my "history of fashion" classes a few years back! what a warm, cozy dress! you look beautiful as always! No way is that jumper Primark! You're clearly getting into our British shops... I love the picture by Damien Hirst! You're so lucky to have that kind of stuff around you all the time. Lucky you that you have the long weekend. Love your sweater. So comfy. It looks like you had a busy week, rest on the weekend. Lovely photos. I'm really loving that big chunky sweaterdress! I wish I had no classes on Friday. Oh well, I hope you plan on taking the tube to get to Paris. I totally hope you have the best time!! You're so lovely with such great style! Love your look and Fragonard's The Swing! This outfit masters at being comfy yet stylish! Oh, we discussed "The Swing" in my AP European History class! I'm so jealous that you got to see it in real life! I love your black/white outfit, by the way. So simple and chic. the knit dress is so cute! such a great layering piece for fall/winter. amazing. you look so cute. I love how you put up your hair!! Hope you have a blast there!! Loving your sweater and chunky scarf! u loos so cute here. great sweater dress. It looks great on you. Great look and I love your hair like this! love your warmy knitted top! Primark is a very good invention! it oppened recently here in portugal, I must find some time to go there! Great pics. Love the post! You look great, love the dress & tights! The jumper dress with the scarf looks great, very cosy and fluffy. Gorgeous outfit. I need more knitwear for autumn. I like that Damien Hirst piece. i love reading about your happenings in london. london is such a special place. i really envy you for studying there :) beautiful outfit! that bun on your head is adorable! Looks very comfy. Your little bun on top of your head is so cute! i am IN love with your outfit. 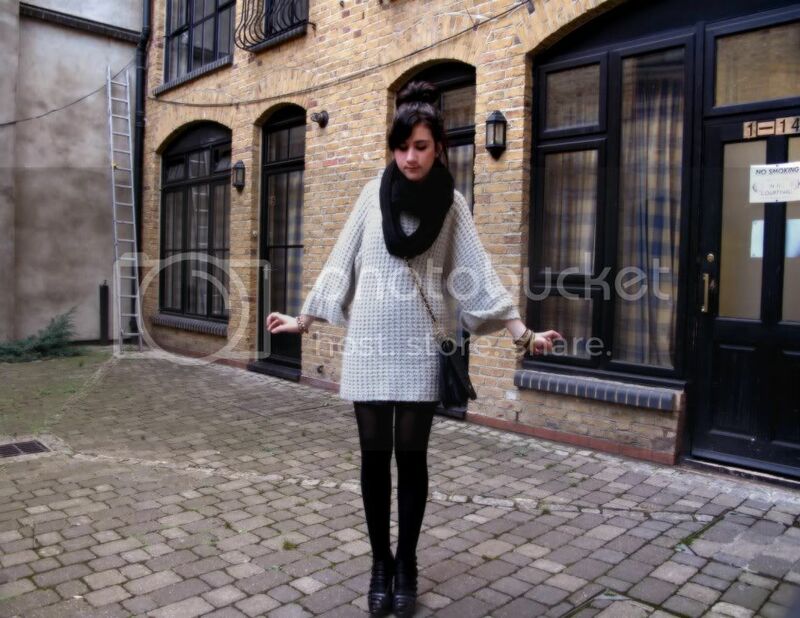 this sweater dress is amazing....definitely need to find one for myself!! and your hair looks great pulled up--so different! That’s a beautiful photo, thanks for sharing this to us. Oh and your fall, winter outfit rock! I really do love your outfit. You look very sophisticated. It’s what a girl’s suppose to wear, very elegantly feminine. I just booked my trip to paris with LastMinuteTravel for Xmas, and dear, i must share with you my last discovery that came up through my trip-planning: You use the tube in paris :) no buses needed, so don't get too accustomed!